Well the second Blog Hop for the 2016 Build A Line Master Class Challenge is here and I want to say that I’m a lot more conscientious of where I am, or need to be. I have learned so much in just these few weeks and we still have a few weeks to go. I have discovered that I am a hobbyist. I also learned a lot more about pricing. One of the participants, Christine Cravens, provided a pyramid explaining the different tiers of pricing and it is of great value to me. I have been working and reworking the pieces I plan for the “Big Reveal”. I’m pretty comfortable with what I have defined as my style and hope that my work is as pleasing to your eye as I am envisioning. Here are a few pics of some of the components I will be using. The five (5) pieces I have and will be working on are pendants, a statement necklace, a bracelet or cuff, earrings and a ring. A few months ago I posted some sweet and simple (bottom tier) pendants and my line will take off from those pendants. Here they are. I have had so many ideas come to mind with these sweet little inverted hearts. 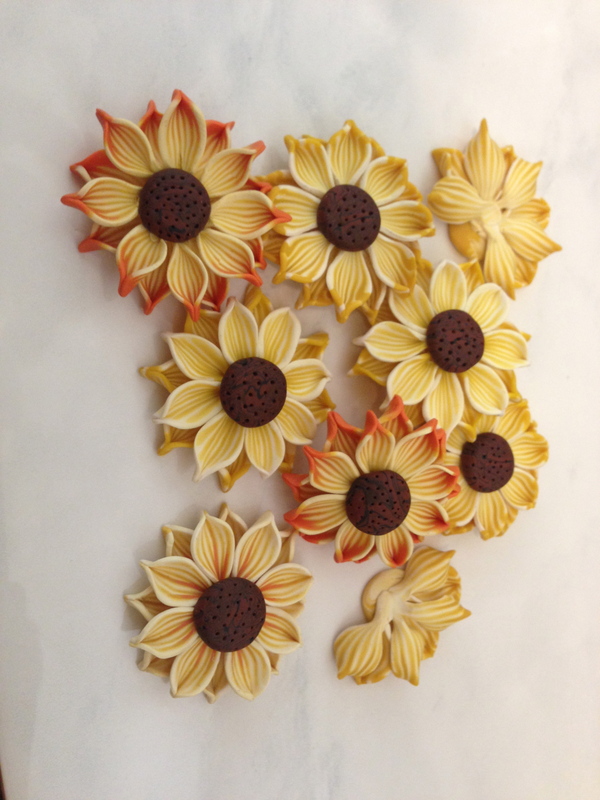 They work up quickly and inexpensively and they are bound to make a nice gift. So I look forward to the next blog hop and the “Final Reveal”. Thank you for visiting and please take a moment to visit the other Participants’ blogs below. Until next time…the “Final Reveal”. See ya then!! The 2016 Build A Line Challenge is here and I am excited to be participating in this Master Class with a very fine group of talented artists. 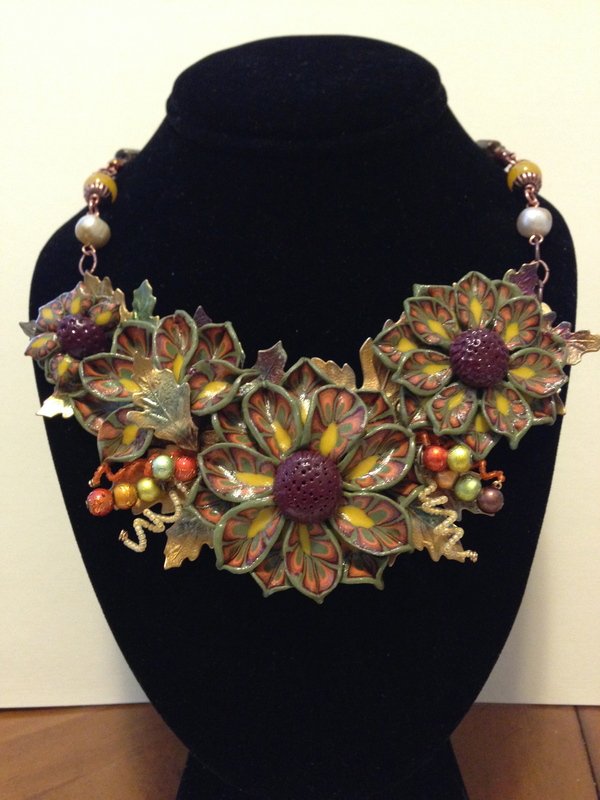 The Challenge runs from January 5 through April 19, 2016 and is sponsored by Brenda Sue Lansdowne, owner of http://www.bsueboutiques.com Brenda is also instructor of this Master Class. 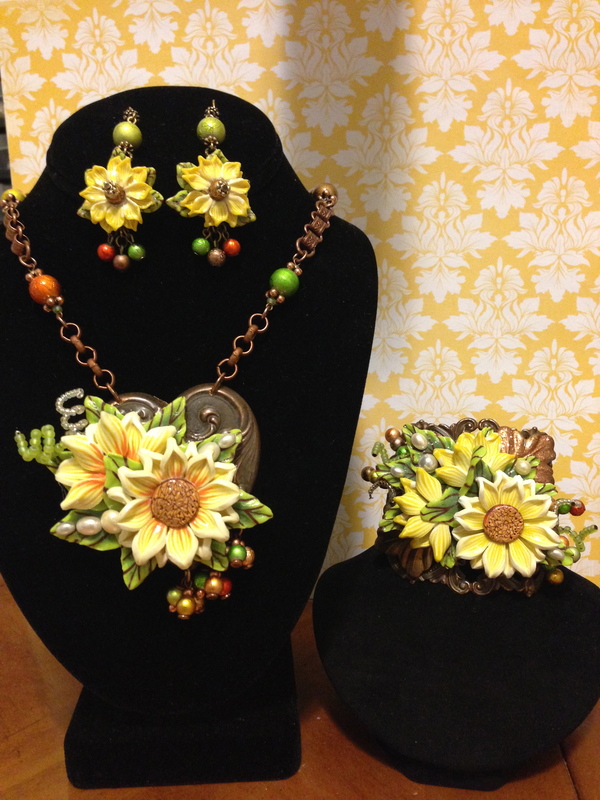 The goal is to define my jewelry style and create a cohesive line of jewelry consisting of 5 pieces. Blog Hop dates are January 29th, February 26th and April 1st, The Final Reveal. A little bit about me, Irene (Renie) Hoffman. 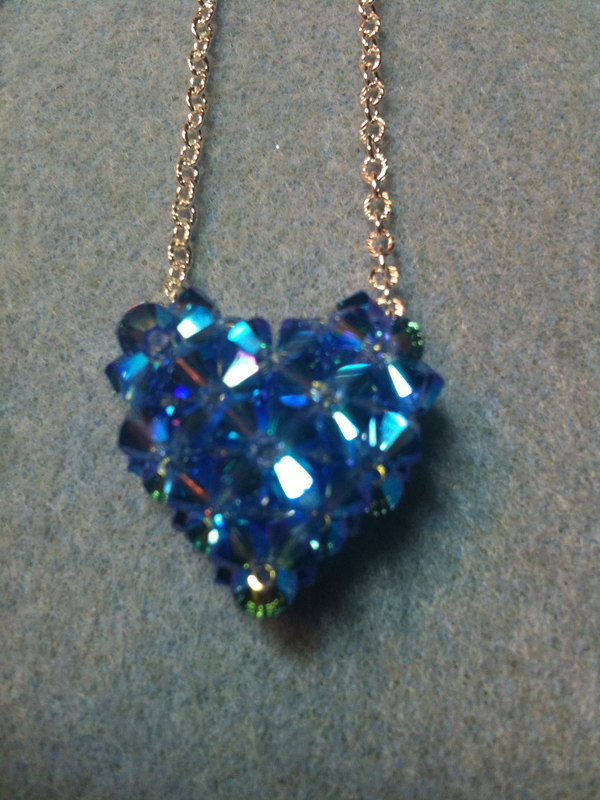 I am owner and designer of Heart’s Dezire Jewelry and started my jewelry business in 2015. I’ve been a Californian all my life and currently live in Murrieta, CA with my husband of 43 years. He is not only a great husband, father and grandfather, he is my biggest cheerleader and always supportive of any of my endeavors. I have two daughters and 3 grandsons with another grandson on the way, due in June/July of this year. Needless to say, they are my world. I started making jewelry as a hobby in 2005 stringing gemstone bead necklaces for sterling silver cabachon pendants, or making earrings and bracelets for myself and my sisters (I had 6 at the time). I started beading with a tutorial from the internet and took a class here and there. 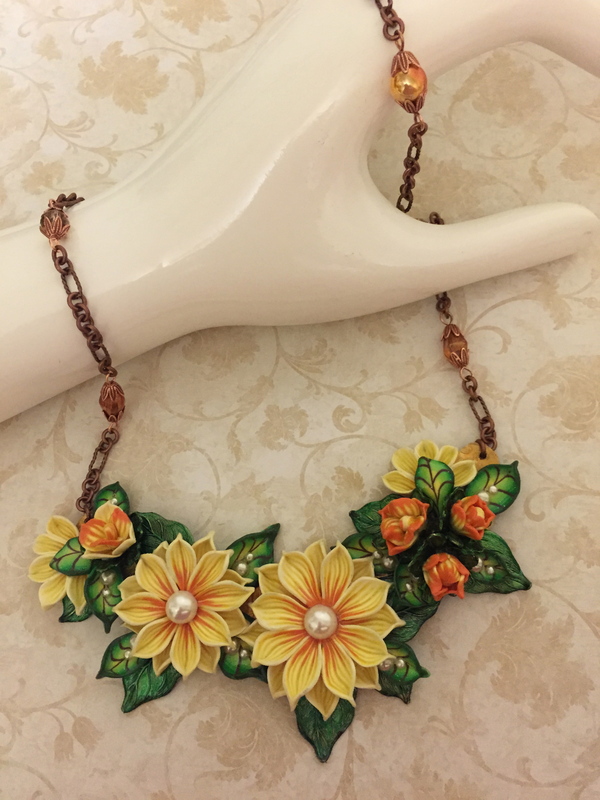 One day I stumbled upon a bead shop in Rancho Cucamonga, CA and that is when it all changed for me, and that is where I met my two dearest friends Marcia Tuzzolino and Jann Tague. 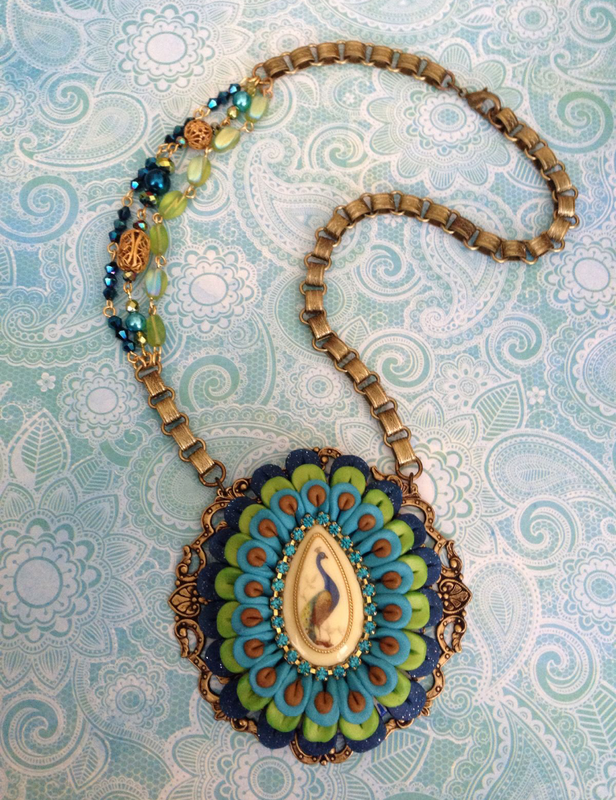 I had done beading, but didn’t know what beading was until I started taking classes at the shop. From then on I branched out taking classes in different medias and techniques. Unfortunately the shop closed and Marcia, Jann and I had nowhere to go so we started meeting for play dates at each others’ homes. In late 2013 I received an invite from one of my buddies to join the B’sue Boutiques Creative Group. 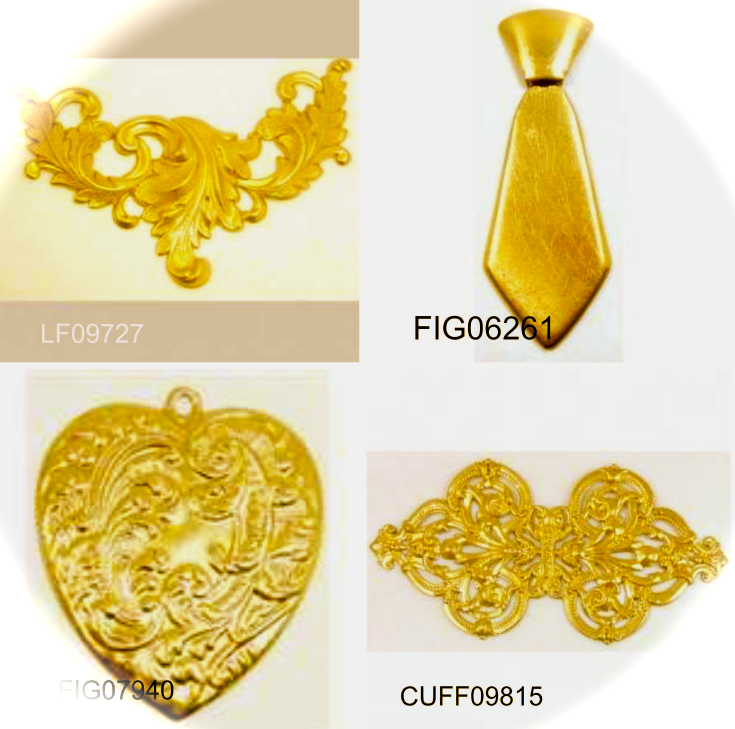 Well, a whole new style of jewelry making began for me and the rest is history. It’s amazing to me at what I am creating today. Thanks to bsueboutiques.com I now have access to many beautiful brass components and in various finishes. 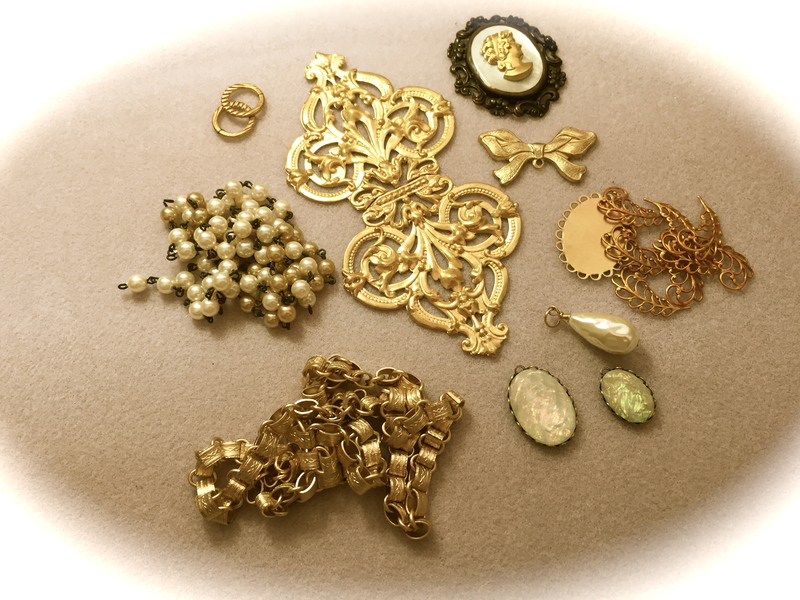 Brenda’s site is certainly a treasure trove for any jewelry maker. Here are a few pics of my early pieces when I started out with the group, my polymer clay cane assemblages and some of my recent faves. Here is a sneak peek of some of the components I plan to use in my line. I’m venturing toward a Classic Casual style. I have a good idea of what I want to create and hope to soon pinpoint what type of customer I want to attract. I will admit that I am struggling a bit with the process but I know that everything will fall into place. And when I’m not in my studio creating I’m caring for this little munschkin, my grandson Jaxson Gage. He is four years old and also my assistant in the studio from time to time. He is one of the loves of my life. I hope you continue on this journey with me to see my progress. Thank you everyone and please take a moment to Like and Comment on my blog. See ya at the next Blog Hop in February. My Co-Participants’ list is below. Please take a moment to view their blogs also. Hello all you beautiful people. The day has arrived for the B’sue Boutiques “Change It Up” Blog Hop and the final reveal. Before I get started I would like to take a moment to enlighten you all on what has been going on with me these past few months. At the beginning of the year I was investing my time in finalizing my father’s estate and completed that in June of this year. Along with that I was visiting and helping a sister of mine going through some health issues. Lastly, of course, I take care of my 3-1/2 year old grandson during the week. All of these matters precluded me from participating in the group as I would have liked to. Sometimes that’s what life is all about. I’m back in the game now and ready and raring to go. 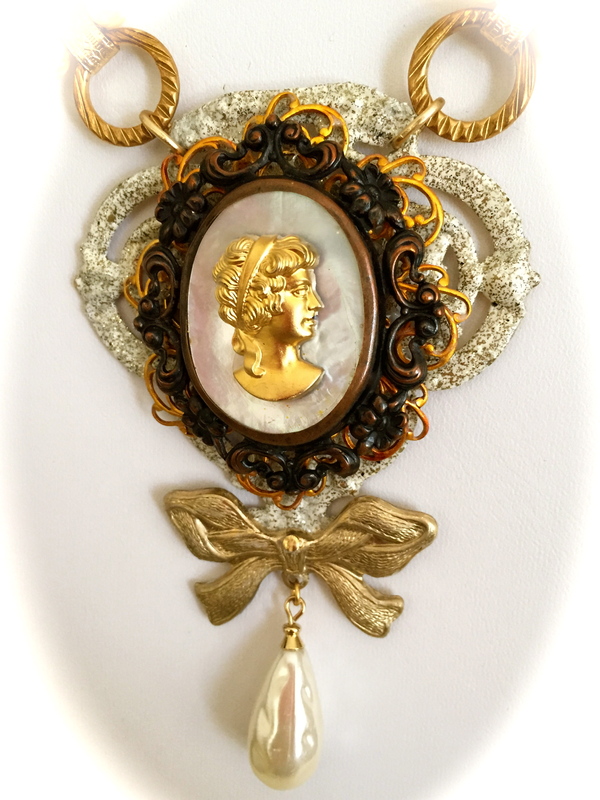 I am very excited to be participating in my first B’sue Boutiques Blog Hop and reveal to you the vintage piece I have created. Participants have been given a list of components to choose from to create their jewelry. My component of choice is CUFF09815. I have used this component on several of my pieces and in different metals. I love this cuff, however, the majority of the time I cut the cuff in half and work it up as a pendant/necklace. I have never been disappointed. 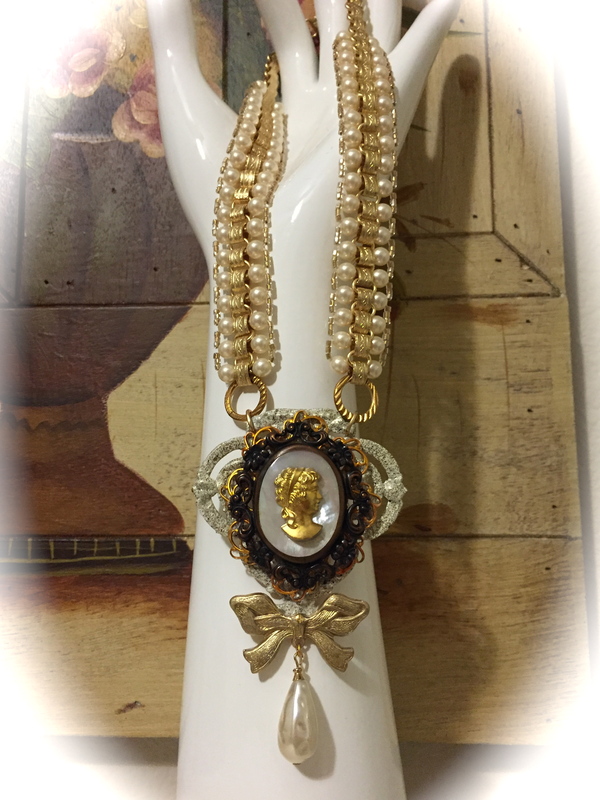 I have chosen to make a vintage choker/necklace. Components are pictured below. The cuff has been cut in half with metal shears and coated with Ivory Iced Enamel. The focal is an oval MOP Cabachon in a Vintage Mount and Cameo with a layer of B’sue filigree leaves nestled around the mount. Cold connected to the bottom of the cuff is a B’sue Raw Brass Bow Stamping and suspended from the bow stamping is a Teardrop Pearl that I found in my stash and it worked beautifully. 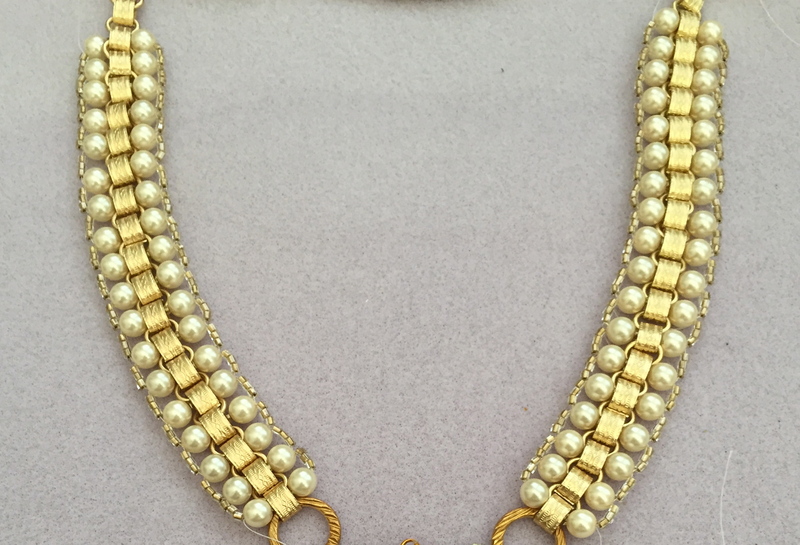 The 18″ neckchain was worked up with B’sue Book Chain, 4mm Czech Glass Pearls and size 11 gold lined seed beads that are woven through the book chain. 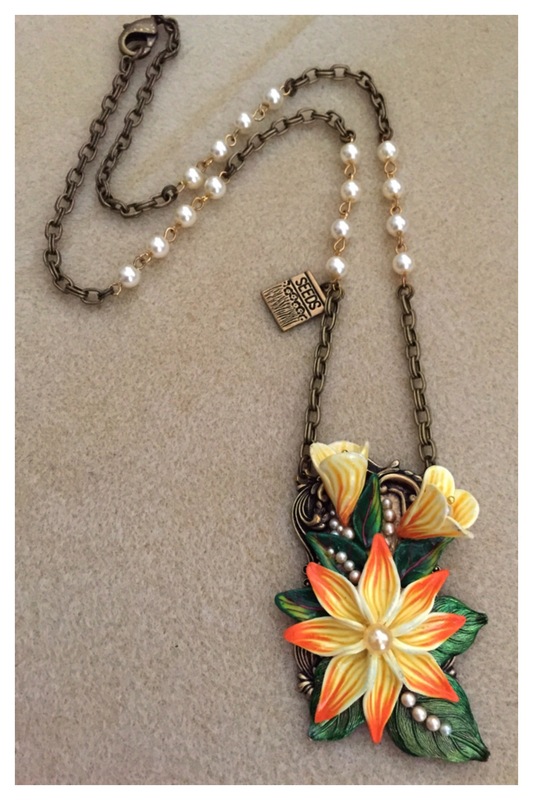 The pearl section is 5-1/2″ with another 3″ section of book chain. I have made several bracelets very similar to this pattern and they are just gorgeous and feel like liquid. The neckchain is connected to the focal with two B’sue Boutiques 16mm Raw Brass Circlets. 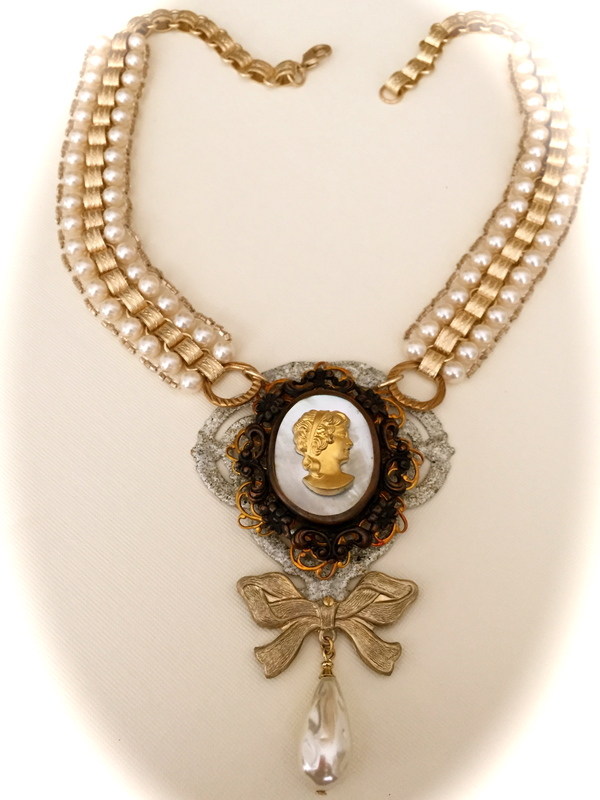 So, without further ado, I would like to reveal to you my Vintage Pearl Cameo Choker Necklace. She is a beauty. 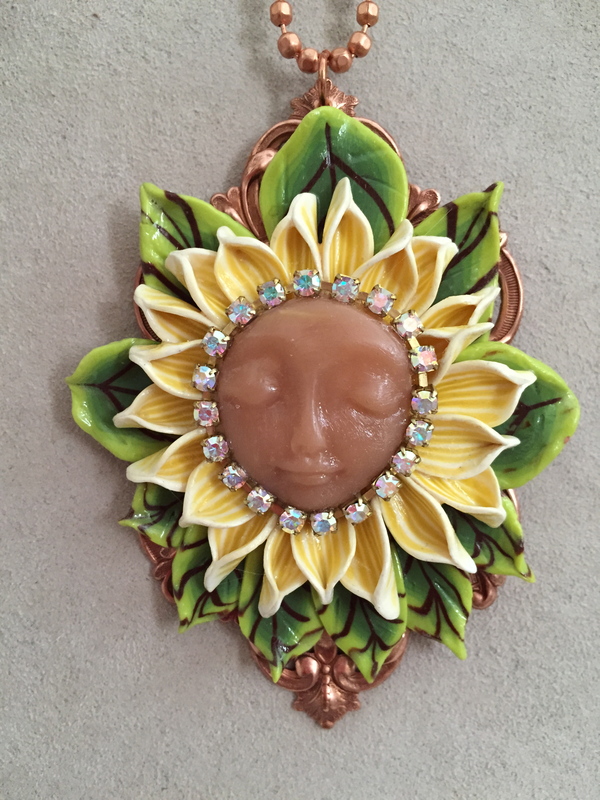 I would also like to share one of my passions, Polymer Clay Creating. 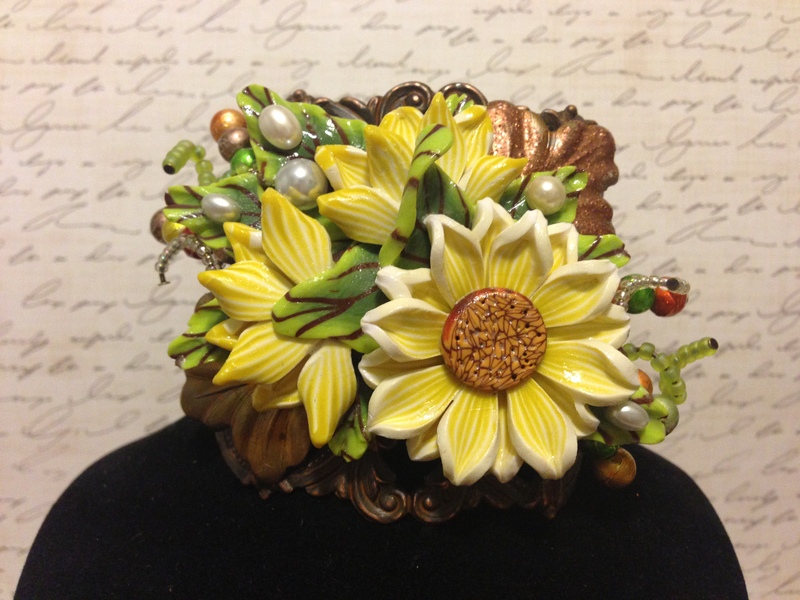 I love working with polymer clay, making flower canes and creating flower assemblages. I would also like to share some of my past assemblages with you. 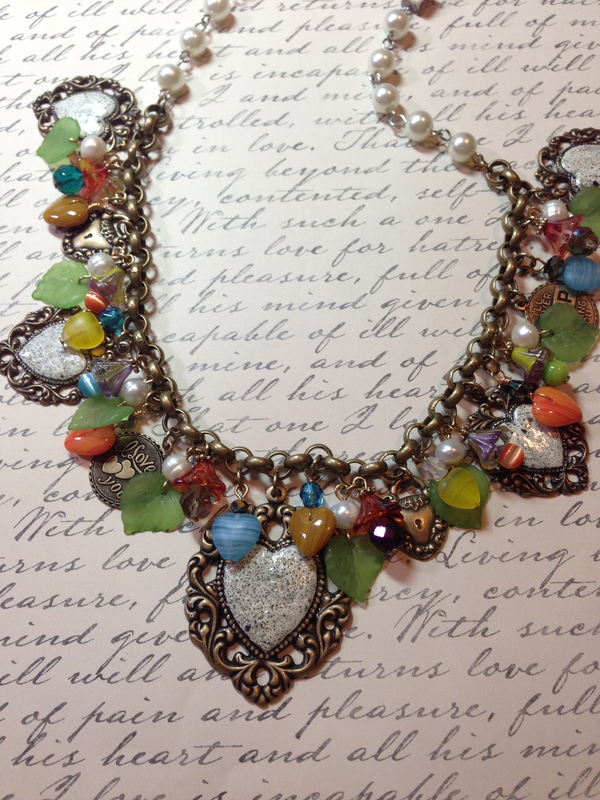 I have recently opened an ETSY shop, Hearts Dezire by Irene, which is in the very beginning stage. I have a few items listed and a big pile of my creations that are ready to be added to my store. So in a few days I would appreciate it if you take a minute to visit my shop and give me a “Like.” https://www.etsy.com/shop/HeartsDezireByIrene. Many listings to come. Thank you in advance. Blog Hop sponsored by B’sue Boutiques, http://www.bsueboutiques.com B’sue Boutiques is also the supply site and sponsor of our group, the B’Sue Boutiques Creative Group. Be sure to visit the blogs of all the participants in this blog hop. You are going to be amazed at all the beautiful creations.